Ulterior is pleased to announce Displace/Reinstate, a group exhibition of three artists: Patrick Berran, Kris Chatterson, and Hiroshi Tachibana. There will be an opening reception on Friday, March 3 from 6 – 8 pm. The exhibition, curated by Hiroshi Tachibana, demonstrates how each artist adapts the process of image transfer and incorporates it into their paintings as a way to focus attention on the surface of the works. Kris Chatterson uses photographs of his own previously made abstract paintings to extract gestural imagery to be used as source material for his transfer paintings. Through the transfer process, the textured surface of the original painting is transformed into a purely graphic image devoid of the materials of the original. Prior to transferring, the canvases are painted by pouring then pulling paint with a squeegee. 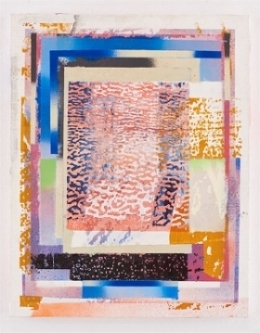 Chatterson chooses to work with such limitations in order to explore alternative modes of generating abstract images. The transfer serves as a conceptual framework to process and manipulate painterly imagery. The transfer becomes a distorted apparition of the original, refined and combined to create a sense of optical radiance. Conversely, Patrick Berran creates paintings with dense imagery resulting from layers of silkscreens, spray paints, and hand-applied paint. These images originate in Berran’s watercolor book. He blows them up, then photocopies them repeatedly until they become a kind of visual static or energy field. The layered marks and patterns multiply and quantify, erode and degrade. The paintings seem to resonate as different layers of imagery surface and are displaced. Hiroshi Tachibana creates an image by working first with a paintbrush on a sheet of polyethylene. When the paint is dry, he places the image face down and transfers it onto canvas using a gel medium. In Tachibana’s process, the transfer functions to keep the physical action of painting distinct from the image that is finalized on the canvas. This division, created by the transfer process, leaves the image independent of the artist’s hand, preserving its own autonomy. Patrick Berran received his MFA from Hunter College and lives and works in New York, NY. His solo exhibitions include: White Columns, New York, NY (2014), Chapter, New York, NY (2014), and South First, Brooklyn, NY (2013). His solo exhibition at Hunter/Whitfield is opening in spring 2017. Kris Chatterson obtained his MFA from Claremont Graduate University in Claremont, CA. Recent exhibitions include: Pour, Florida Atlantic University Gallery, Boca Raton, Florida (2013), Grey Full, Jeff Bailey Gallery, New York, NY (2013), and a solo exhibition at Jeff Bailey Gallery, New York, NY (2011). He currently lives and works in Rhode Island. Hiroshi Tachibana graduated from Bard College in Annandale-on-Hudson, NY, in 2002 and currently divides his time between the United States and Japan. His work is now on view at Harmas Gallery, Tokyo (through March 11). Other recent exhibitions include: XYZ Collective, Tokyo (2015), Kristin Hjellegjerde Gallery, London, (2015), and Sprout Curation, Tokyo (2014).